The pace of urbanization and the number of people living in urban settings has increased exponentially over the course of the past century, with more than half of the world’s population now living in urban areas. Urbanization is driven by the concentration of investment and employment opportunities in urban areas. It is estimated that half of the population of Asia will live in cities by 2020, and Africa will reach that proportion by 2035. At present, one billion people are living in informal settlements that lack basic services and 60 percent of urban dwellers are physically exposed to natural hazards and pollution. The urban slum population is projected to increase to 2 billion people by 2030 (UN 2003). One vital component of any strategy to improve living conditions for the urban poor involves improving the legal and regulatory environment related to housing and increasing the supply of affordable, legal shelter with tenure security and access to basic services and amenities. This brief examines key issues in land tenure and property rights that will likely be confronted by USAID’s growing urban portfolio. Secure land tenure and property rights are the gateway to achieving many of USAID’s development goals in urban areas. The first section of this brief provides a background on urbanization. Cities attract newcomers through the prospect of economic opportunity. Growing urban populations lead to competition for housing and increases in urban land and property prices. As property values rise, property owners are able to capture value by increasing rental rates, sellers by charging higher prices when property is transferred. With few if any affordable choices, the urban poor are forced into high-density slums in the inner city, less expensive peripheral areas with poor access to livelihoods and services, or a wide range of informal settlements. The second section explains why secure tenure is a necessary condition to have access to economic opportunity, including livelihoods, credit markets, public and municipal services. However, secure tenure is not “one size fits all.” There is a range of tenure status categories (see Figure 1 below), any of which may be ‘secure enough’ to fulfill an individual’s needs. It is also important to note that tenure security is both “real” and “perceived.” For example, a family living in a slum for years without any formal documentation to prove they purchased their home do not have “real” or formal security, yet may believe that for a variety of reasons—for example, that the city is providing electrical service to the area—they are highly unlikely to be evicted. The family has perceived security. Compare this to a migrant worker who has a formal rental contract but has little chance of enforcing her rights if the landlord or someone else chooses to evict her. Real security does not automatically follow from perceived security. Third, the brief will present local examples of pragmatic approaches to improving urban tenure security and property rights. Evidence on tenure options shows that individual land titles and freehold home ownership are not the only means of providing security and may only be available to those in full-time, stable employment with reasonable incomes. Short-term tenure options may be more appropriate for the young or poor as they provide the flexibility required to pursue livelihood opportunities. Next, the brief discusses several approaches to granting residents secure tenure and better economic prospects. Often, they can be achieved by cheaper and simpler alternative approaches to titling, such as the provision of services (by the municipality or non-governmental organizations) and participatory mapping by the community. Finally, the brief provides recommendations that USAID program staff (and that of other donors) should keep in mind when designing and implementing projects to improve tenure security and access to services for all urban citizens. The recommendations are consistent with USAID’s 2013 policy, “Sustainable Service Delivery in an Increasingly Urbanized World,” (Urban Services Policy) that identifies improved urban service delivery as the key to unlocking the potential of urbanizing areas. Urban areas are a vital component of social and economic progress. They are drivers of innovation and therefore magnets for enterprising migrants. No country has achieved high levels of economic development without a high level of urbanization (Satterthwaite, 2007). As such, an increase in the proportion of national populations living in urban areas is an integral part of a country’s progress toward a more globally integrated, dynamic, and industrialized economy. In all countries, urban areas contribute substantially to national Gross Domestic Product (GDP) and to government tax revenues. More than half of the world’s population now lives in urban areas; between 2011 and 2030, that total is expected to grow by an additional 1.4 billion people. The overwhelming majority of this increase is expected to be in developing countries, whose built-up urban land area could triple by 2030, from 200,000 to 600,000 square kilometers (sq. km.). This 400,000 sq. km. increase would be equal to the world’s total combined urban area in 2004 (UN 2008). Urban population growth is caused by a combination of births within the existing urban population and rural- to-urban migration. Individuals and families are pushed out of rural areas by under-employment, poor agricultural conditions, and conflict. They are pulled to urban areas by the prospect of economic opportunity and, for some, expanded social networks. Urban areas can also attract both domestic and international investment with the availability of an educated and skilled labor force. The housing needs of this labor force vary widely. Traditionally, rural-to-urban migrants initially seek cheap, short-term accommodation in inner city slums, which provide good access to livelihood opportunities. Providing such ‘reception areas’ is therefore vital in developing responsive land and housing markets. More established workers typically seek longer term security in better housing farther from central locations. Unfortunately, urban services and housing supply have largely failed to keep pace with demand and are often plagued by poor planning and operating capacity, complex regulatory requirements, corruption, and inadequate maintenance. With market forces driving up land and property prices, and polices that provide few incentives to develop low-income housing, many are left with no chance to buy or even rent adequate legal housing, which increases social and economic inequality. Rather, many people are forced to share accommodation in over-crowded, substandard, inner city areas, or move out into lower cost peripheral areas with limited access to services or livelihood opportunities. Large sections of the urban population are thus exposed to environmental dangers (USAID 2013), and unhealthy living conditions in unsanitary, over-crowded settlements, particularly marginalized citizens, including women (Baruah 2007), children and the poor. Living in such conditions undermines the ability of the urban poor to fully contribute to or benefit from economic development and denies them rights they may hold under national constitutions or through international conventions. The rate and scale of urbanization and urban growth has placed an enormous burden on national and local governments, most of which have been overwhelmed by a lack of capacity, funding, authority and revenues. National and local governments also struggle with overlapping and competing government agencies, ineffective land administration, incomplete or outdated property registries, inappropriate zoning, cumbersome and complex building codes, and corruption. Many urbanizing countries inherited European legal and administrative frameworks from colonial periods. As a result, many plans and regulations are imbued with, and senior officials think in terms of, concepts and practices designed for conditions that no longer apply. While urban areas do account for 60 to 80 percent of global energy use and generate 70 percent of greenhouse gas emissions, on a per capita basis they are more energy efficient than rural area. They are also most affected by climate change (USAID 2013; World Bank 2010). Model projections of the impact of sea level rise and increased flooding indicate that by 2050 more than one million people will be directly affected by sea level rise in three mega-deltas alone: the Ganges-Brahmaputra delta in Bangladesh, the Mekong delta in Vietnam, and the Nile delta in Egypt (Quan and Dyer 2008). The greatest danger comes from the compound effects of storm surges and high tides (Satterthwaite 2006), to which millions of residents in low-lying informal urban settlements are particularly vulnerable. Environmental mitigation efforts can be coupled with efforts to secure tenure in order to mitigate these risks. Community enumerations (mapping households and existing services in informal settlements) help identify infrastructure needs and policy and enforcement efforts that secure housing and property rights provide the poor with incentives to improve housing structures. Such efforts do, however require political will to invest in and enforce them. The challenge is how to manage urban growth in ways that are environmentally sustainable, empower all sections of the urban population, and maximize the benefits of economic development within existing resource constraints. This challenge can only be met if all urban residents have adequate tenure security and access to public services. The problems associated with urbanization are increasingly seen as failures in governance, including land administration and urban planning, rather than the size of the city per se. The effects of rapid urbanization include poor quality or insufficient housing, lack of clean water, limited sanitation and electricity infrastructure, overcrowding, food insecurity, environmental degradation, threats of eviction, settlements in zones that are prone to natural disasters, poor health of residents, and the increasing vulnerability of women, the poor, children and other marginalized groups. Secure tenure is a necessary condition to improve access to economic opportunity, including livelihoods, credit markets, public and municipal services. When tenure rights are insecure people have reduced incentives to invest in and upgrade land and housing; they may be forced to leave a family member home to guard property rather than work or go to school; and, they may often lack access to services to devote significant portions of their time and income to acquire these. The options for obtaining land with secure tenure are governed by prevailing legal and institutional frameworks. In many countries, urban tenure systems are different from those in rural areas. As urban areas gradually expand into rural areas, they form peri-urban areas in which these two inconsistent tenure systems create confusion and conflict. Urban tenure systems are based on statutory law and are officially recognized, but rural practices, based on custom, are still widely used and accepted. Although many countries (e.g. Ethiopia, Mongolia) retain public ownership of all land and others (e.g. Lesotho and Papua New Guinea) hold land under customary ownership, most countries now permit private ownership of land, especially in urban areas. Private (and private-like—e.g. long term leases) ownership tenure systems are a foundation of market economies and define land values in terms of a market price, rather than its use value or fertility (as is more prevalent in rural areas). Strong demand has raised urban land prices so that in many large cities of the Global South, land in urban areas is now often as expensive as in the more affluent West. This makes land purchases prohibitively expensive for the poor and increases the importance of well-functioning and transparent property rental markets. 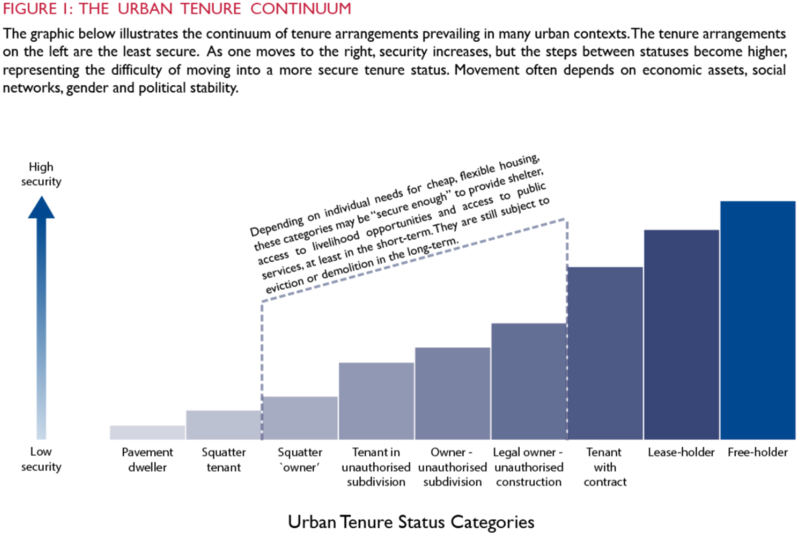 One way of presenting the range of tenure status categories is as steps along a continuum, from the least formal, such as pavement dwelling, through informal/illegal squatting, to officially recognized squatting, to legally acquired land that is not developed in conformity to official norms, to various forms of legal tenure, such as tenants with a contract, leaseholders and registered freeholders (see Figure 1). According to the United Nations’ Global Land Tool Network, 70 percent of land in most developing countries is held under a category other than registered freehold (GLTN 2012). Informality can also take many forms. Not all slums are illegal or unauthorized. Many are fully legal – recognized by the appropriate government authority – but have poor infrastructure and services or are lacking documentation. Others are located on land that the occupier purchased through appropriate legal channels, but the transaction is not recorded in a land registry or the land is not zoned for residential development. Each of these tenure sub-categories may serve groups with different income levels and needs and so represent a component of that groups’ coping strategy for life in an urban environment. Understanding how informal settlements help the poor and marginalized cope is critical to understanding how best to upgrade settlements and integrate the poor into sustainable and livable cities. In addition to tenure status, the property rights associated with each form of tenure will determine whether residents are entitled to develop, sell, transfer, inherit, sublet, or use a property and access public services or formal credit. These rights may apply only to men or to men and women equally. Priorities for tenure security are strongly influenced by personal circumstances, gender, and resources. For the young, or those recently arrived in an urban center, residential mobility to follow livelihood opportunities on short notice is commonly a high priority. For those already established within the urban economy, the priority is more likely to be for longer term tenure options in order to raise a family, build a business or pursue a career. Later in life, people may prefer forms of tenure that provide them with additional support. The more tenure options that are available, the easier it may be for people to move from insecure informal tenure categories to more secure and formal options and integrate into the local community. There is a close correlation between tenure status, access to services, and public health. As the location for major industries, cities are generators of polluting emissions that contribute to climate change and health risks. They also generate vast quantities of solid and human waste, the disposal of which can have serious impacts on public health. These impacts are felt disproportionately by the urban poor, as the only areas they can afford to live in are often near factories, waste dumps and other sources of pollution, or on low-lying areas vulnerable to a rise in sea levels. More than 1 billion people currently lack access to safe drinking water, and those who nominally have “improved service” suffer problems of both water quality and service reliability. Approximately 2.6 billion people lack access to adequate sanitation and 1.1 billion people practice open defecation. In some countries, legal or procedural constraints prevent the provision of public services to formally areas for development purposes. In others, low planning densities may make service provision prohibitively expensive for residents and service providers. USAID’s Urban Services Policy highlights the need to improve urban service delivery in order to unlock the potential of an increasingly urbanized world. Likewise, urban service provision can vastly improve the perception of tenure security. The foundation for more secure land tenure and property rights is also found in several other principles of the Urban Services Policy. Those principles represent the intention of USAID to increase funding for programs that: bolster local capacity and accountability for the management of urban service delivery systems; improve governance; increase sustainability through domestic financing and public- private collaborations; support the construction and maintenance of climate resilient infrastructure; and promote social inclusion and equality by giving particular attention to those disproportionately affected by urban service gaps (women, children, and the disabled). The wider range of program approaches is necessary because while service delivery can be an important signal that evictions are less likely and that tenure is more secure, by itself, providing services may not be enough to create a sense of tenure security. In Colombo, Sri Lanka proof of payment of electricity bills to the state’s electricity board, official occupancy permits, and residential addresses recorded in the official voter register did not provide secure enough tenure for poor urban families to receive compensation for property damage following the 2004 Indian Ocean tsunami (Caron 2009). Therefore, it is important to examine local context to develop an appropriate urban land tenure and property rights program and consider how exceptional circumstances such as a natural disaster may alter tenure status and perceived senses of security. The rapid and often uncontrolled growth of urban areas in developing economies has focused attention on the need to improve legal access to land and services for the existing and future urban populations. Extensive areas of substandard inner-city development pose a threat to public health, threaten prospects for economic development, and increase the risk of social conflict. Meanwhile, peri-urban sprawl encroaches on valuable agricultural land and increases the costs of installing public access and infrastructure. Addressing these issues requires considerable political will, administrative commitment and continuity, as well as technical support. For many years, a common policy for improving tenure security in informal settlements, as well as increasing access to credit and services, was to provide individual freehold titles to land and property. The assumption was that formal titling would raise property values. In turn, residents would be able to use the enhanced value of their properties as collateral to obtain formal credit, improve their properties, and invest in a business to lift themselves out of poverty (de Soto 2000). With improved security residents do improve their housing stock and often build and improve home-based business. However, they may, with good reason, hesitate to use a formally titled home as collateral for a commercial loan. Should they default on the loan residents risk losing their home and any home-based business they have as well as any rental income they generate from leasing rooms or backyard shacks. Constrained property markets mean they are unlikely to find cost-effective alternatives (Mitchell 2009, Payne, Durand-Lasserve and Rakodi 2009). Individual titling can also harm women if male heads of households are titled but spouses are not. For many of the urban poor, improving the legal and regulatory framework to support well-functioning rental markets may be even more useful than large-scale titling programs. Given the complexity of urban land tenure and property rights and the limited capability (or willingness) of government at national and local levels to meet the increasing challenge, no single form of tenure can meet the diverse and changing needs of large urban populations. It is therefore important to consider a range of pragmatic approaches to improving tenure security and access to public services. Examples of simple approaches to improve tenure security along a continuum of rights can be found throughout the developing world. The following examples are affordable, accessible and, most importantly, appropriate for the context in which they have been applied. The examples fall into three basic categories: recognition by authorities; protection from eviction or exclusion; and community-based rights. Community-based rights provide an opportunity to cooperate and gain power through numbers. Officially recognized slums or informal settlements (India, Brazil): In India, slums classified as “unobjectionable” are eligible for upgrading. “Objectionable” slums are those in non-residential zones, on low-lying lands, or where roads and other public infrastructure have been proposed. All residents in the unobjectionable settlements have this basic form of tenure, which is sometimes accompanied by the provision of public services, such as access roads, electricity, water supply and sanitation. Physical upgrading of informal settlements (Colombia, Indonesia, Pakistan): In select locations, informal urban settlements have been provided public open space, water, sanitation and power networks. These services create a high level of perceived tenure security without a formal change of legal status and have encouraged local improvements and investment. Certificate of Comfort (CoC) (Trinidad and Tobago): The CoC gives holders a guarantee that they will not be removed from their dwelling or plot unless an alternative plot is identified and made available. Hekr tenure (Egypt): Under Hekr tenure, a modest ground rent is charged to informal settlers on unclaimed government land. It does not grant title, and cannot be transferred, but ensures that if households have to be displaced, they will receive compensation for buildings erected on their plots. Temporary Occupation License (ToL) (Kenya): TOLs were introduced in Nairobi to stimulate investment in small businesses as well as promote the efficient use of idle public land in strategic locations. Licenses are allocated annually on a renewable basis for a land rental fee and entitle licensees to construct semi- permanent structures. Temporary Communal Land Rental (Thailand): Temporary communal land rental allows poor groups to live for a fixed period in inner city areas that would normally be too expensive for them. The owners of the land benefit by earning income from renters until they decide to develop the site. Local authorities provide services according to the rental period. Once that period expires, communities are given notice to negotiate a similar arrangement with another landowner. Collective land ownership (Thailand): This program in Bangkok provided formal protection against market forces by encouraging collective forms of land ownership in combination with government infrastructure subsidies to improve living conditions. Between 2003 and 2008, the program supported 512 upgrading initiatives (Boonyabancha 2009). Co-operatives (South Africa, Philippines): Under co-operatives, land or housing is owned and run by and for members, whether they are customers, employees or residents. Members have an equal say and share of profits deriving from shared land and housing assets. Community Land Trust (CLT) (Kenya): A CLT is a mechanism for creating community ownership of land, locking in land value and underpinning sustainable development for the benefit of a defined locality or community. CLTs enable low-income or middle-income local residents to own or rent decent housing. They are limited in developing countries by the need for a legal framework and administrative support. These approaches demonstrate the wide range of tools that promote recognizing the need to regularize or formalize tenure status in ways that enjoy social legitimacy (Payne 2002) and improve the provision of public services, access and public open space. These approaches work because they provide technical, affordable, contextually appropriate solutions for a range of tenure rights in cities. Furthermore, these rights can be recorded, forming the basis of data and information needed to improve, plan, manage, and finance cities and municipal services and infrastructure. Experience demonstrates that each tenure option has benefits and limitations. Identifying which approach is most appropriate will depend upon local conditions. Success will also depend upon the underlying property right—either state or private ownership of land which is occupied. A key consideration when designing urban projects is the impact it will have on perceived tenure security. While few people will invest unless they feel secure, this does not necessarily mean that they require full, individual ownership of land or property. The limitations of land titling programs have been widely noted (Calderon Cockburn 2002; Gilbert 2002), and so use of this approach should be tempered by recognition of these limitations (Cousins et al 2005). Experience shows that the pragmatic approaches to tenure security listed in the previous section can achieve many of the same objectives as individualized titling and at lower cost. For example, residents in Trinidad and Tobago report that the Certificate of Comfort provides sufficient tenure security as no evictions take place. A socially and financially effective means of providing an adequate, or locally acceptable, form of land tenure is to improve the rights associated with existing forms of tenure. This can be achieved at no cost by designating selected informal settlements as ‘unobjectionable’ as in India, or announcing a ban on forced evictions without due process, adequate compensation, and a right to appeal. These simple measures can significantly enhance tenure security, facilitate service delivery and stimulate investment in home improvements. The Social Tenure Domain Model (STDM) represents a new way of thinking about land, property, parcels, owners and ownership. As a tool, the STDM enables all local stakeholders in a property or piece of land (not necessarily the owners) to document that space. Rather than considering the land as a mutually-exclusive parcel, the stakeholders document it in ways that reflect and express all of the tenure arrangements and relationships to it, including secondary rights. Unlike formal land administration systems and software, STDM is open, free, transparent, flexible, mobile and scalable based on the technological capacities of the context in which it is being used. STDM provides an opportunity for social inclusion. The Voluntary Guidelines for the Responsible Governance of Tenure of Land, Fisheries, and Forests (Voluntary Guidelines) also provide a new basis for focusing on tenure security. The Guidelines, unanimously adopted by 96 countries in 2012, recommend that “States should promote policies and laws to provide recognition to such informal tenure. The process of establishing these policies and laws should be participatory, gender sensitive and strive to make provision for technical and legal support to affected communities and individuals. In particular, States should acknowledge the emergence of informal tenure arising from large-scale migrations” (FAO and CFS 2012). Indirect measures may increase tenure security and investment in home improvements significantly and avoid the expense and political sensitivities associated with some formal titling programs. In Karachi, Pakistan a local NGO organized residents to install a sewer system for up to one million residents, reducing demand for formal titles. In Mumbai, India improved services and ten-year leases stimulated substantial investment in home improvements. The Constitution of Colombia entitles all citizens access to all public services on the sole condition that they can pay for them; tenure status is not relevant. As a result of these approaches, residents consider themselves sufficiently secure to invest what they can in improving their homes and pay for the services they receive. It should not be assumed that those living in informal urban settlements are passive victims of an oppressive urban environment. Participatory methods of recording land rights through community enumeration (UN- Habitat 2010) and street addressing programs (surveying and mapping to create addresses) as promoted by the World Bank, are effective means of improving security and creating a sense of belonging and citizenship (Menon, 2010). The achievements of numerous local, national and international alliances of community groups and NGOs, such as Slum/Shack Dwellers International, the International Federation of Slum Dwellers, the Asian Coalition of Housing Rights, Habitat International Coalition and the International Alliance of Inhabitants, all testify to the effective role that communities can and do play in improving access to land, services, housing and credit. In most of these examples, residents are free to exchange their property through the market, or work from home, enabling them to use land and property as a means of economic betterment. They also put available land to efficient use, which reduces urban sprawl, transport costs and emissions, and impacts on scarce agricultural land. More progress is needed to implement and enforce policies that enhance tenure security of the urban poor so that they are better able to share in benefits of development and economic growth. The innovative local approaches described in this brief have not been replicated at the scale and speed necessary to make a significant impact. Despite the fact that these approaches have achieved strong positive outcomes, they tend to be rejected by many government officials. If, as USAID’s Urban Services Policy posits, urban service delivery is critical to unlocking the potential of an increasingly urbanized world then, increasing access to, and availability of, quality public services is imperative. Improved service delivery depends on increasing the capacity of national governments and municipalities as well as on shifting the legal and regulatory environment. The following recommendations are consistent with these principles. To achieve significant progress in improving tenure security and access to services for all urban citizens, it is important to develop positive relationships with a wide range of stakeholders in the private and civil society sectors. This will help to foster economic growth and land tenure and property rights resilience. Assess how any upgrading, infrastructure or legal/regulatory reform project will impact vulnerable groups including women, the young, the elderly, minority groups as well as the broader category of the poor. Impacts can be both positive and negative and affected parties should be consulted and informed about potential costs and benefits before a project is designed and implemented. Encourage the use of strategies (participatory mapping, government commitments to recognize communities) that will provide short-term security for residents in urban and peri-urban areas who are at-risk. This will enable next steps, including regularization and upgrading for all residents. Working collaboratively with affected communities, civil society and local officials, identify infrastructure projects that will improve access to or directly provide water, sanitation and electricity service while taking care to protect rights so that local people are not wrongfully displaced or disproportionately harmed as a result of infrastructure projects. Consider how legal and regulatory improvements to rental markets and communal tenure options may improve tenure security and enhance the ability of the poor to access low-cost housing. Consider how legal and regulatory improvement to building codes and zoning rules impede the provision of low-cost housing. Ensure that all tenure options respect national and international human rights legislation and commitments that provide protection from forced evictions.